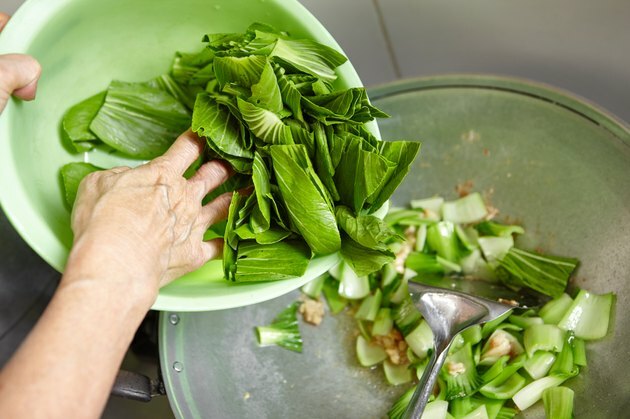 How Do I Prepare and Use Bok Choy? Bok choy is a staple of many Asian dishes and particularly of Chinese food, where it's a common element of many stir-fry dishes. It's a member of the cabbage family and has thick white stalks and dark green leaves. Baby bok choy, a smaller variety, is more tender than the mature version of the vegetable. When buying the vegetable, look for firm stalks and leaves that aren't wilted. Bok choy is high in beta carotene, which some studies have linked to a reduced cancer rate. One 3-ounce serving contains only 10 calories and is fat-free. While bok choy can be eaten raw, steamed or boiled, one of the most common and flavorful ways to prepare the vegetable is to sautee it. Trim the very end of the bok choy stems off and discard. Wash the bok choy under cold water. Dirt tends to collect toward the base of the stems. Scrub off any remaining dirt, using a vegetable brush, until the stems and leaves are clean. Cut and separate the leaves from the stems with a sharp knife, making two piles. Since the leaves cook more quickly than the stems, you'll want to stir-fry them first. Cut the stalks into 1/2-inch pieces. Add garlic and cook until it's golden, but not brown. Add ginger and the bok choy stems to the skillet. Cook for six minutes, or until they're slightly tender. Remove from heat when they're bright green and just wilted. This should take about three minutes. Fruits and Veggies More Matters: Bok Choy. Nutrition. Selection. Storage.